Join us on an inspiring journey through the land of Israel! Nowhere else in the world causes the Bible to come to life like the sites we will visit on this trip. 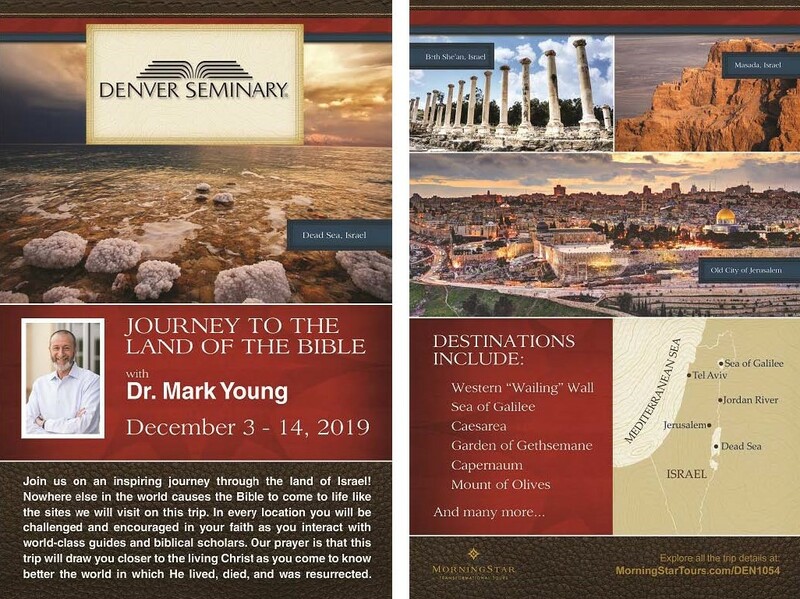 In every location you will be challenged and encouraged in your faith as you interact with world-class guides and additional teachings from Denver Seminary professor Dr. Knut Heim and President Mark Young. Our prayer is that this trip will draw you closer to the living Christ as you come to know better the world in which He lived, died, and was resurrected. This trip is limited to one bus of 48 guests. The cost is $4,450 per person (double occupancy) plus airfare. *This trip is not for course credit. If you have any questions please reach out to our Vice President of Advancement Chris Johnson by or phone (303.762.6924), or view the trip website by clicking the link below.